In 1968, when Jim changed the name of his company from Muppets Inc. to Henson Associates, he got the added benefit of an acronym that was appropriate to his work: HA! When new stationery was designed in the 1970s, the HA! 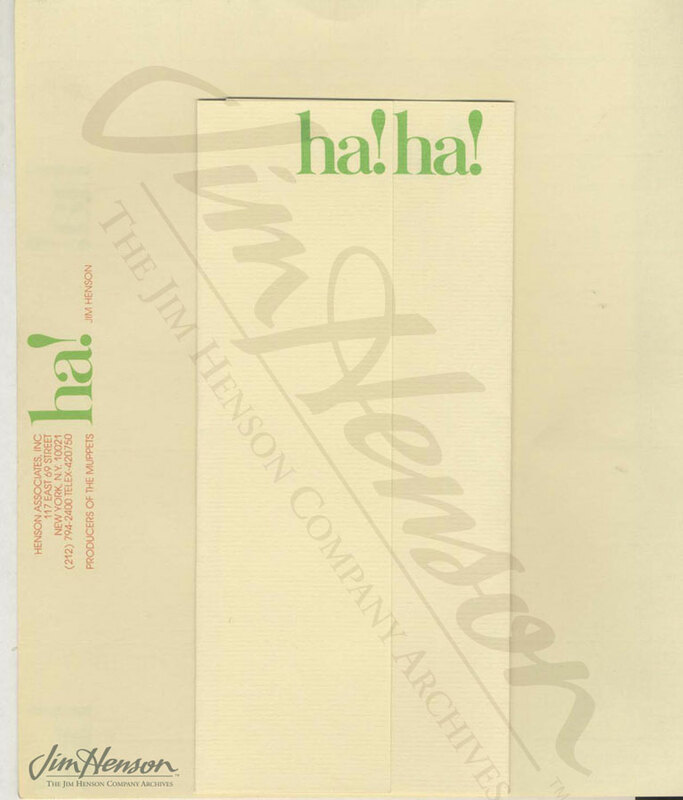 logo was printed twice on the back of the paper so that when folded, a recipient of Henson correspondence would be greeted with “ha! ha!” when opening an envelope. Jim’s lawyer, Al Gottesmen, asked that a special run of the stationery be printed for him without the logos on the back so that his cease and desist letters and business proposals might be taken seriously. As time went on, Jim named various units of his company to have similar acronyms. His international licensing unit, Henson Enterprises, was HE! The Henson Electronic Products division (computer games and software, licensed electronic products) was HEP! A production group, Henson International, based in New York was HI! 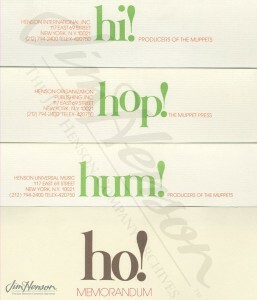 while the London production unit, the Henson Organization, was HO! The international television distribution division, Henson International Television was HIT! and eventually became an independent company using only the acronym as its full name. HOP! 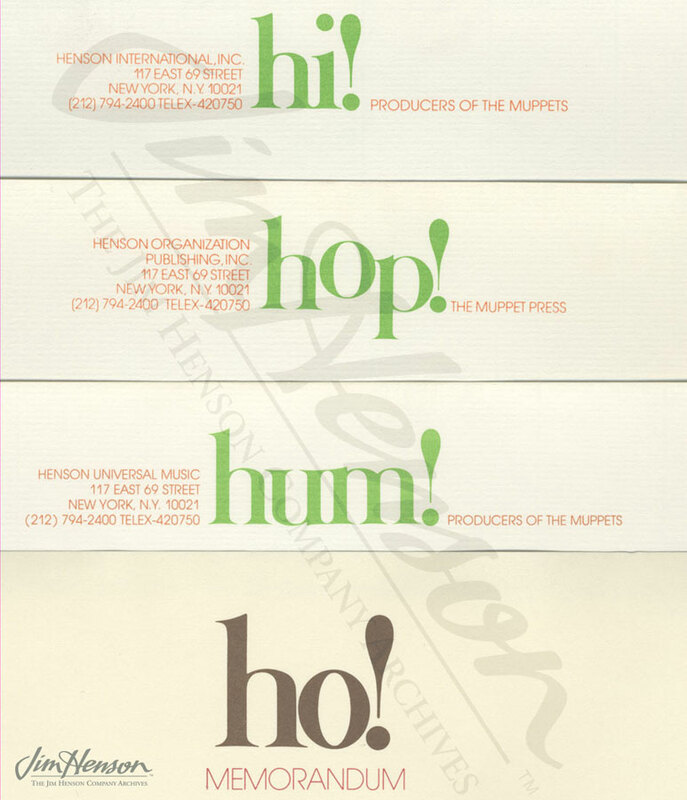 was Henson Organization Publishing (probably Kermit’s favorite), and for music products, there was HUM! a.k.a. Henson Universal Music. So, when Jim met with HE, HO and HIT in 1984, it was a gathering of his London team to talk business and then have some fun aboard a boat on the Thames. Two weeks later, his New York group met for two days in Sterling Forest, a state park north of Manhattan, for similar discussions and socializing. The Ha! logo, designed in 1975 by David Kaestle, read “ha! ha!” when the stationery was folded. 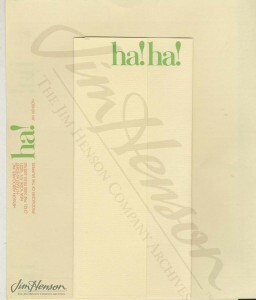 Letterhead for the various divisions of Henson Associates. This entry was posted in 09-September '84, 1984, Social and tagged Al Gottesmen, enson Organization Publishing, Henson Associates, Henson Electronic Products, Henson Enterprises, Henson International, Henson International Television, Henson Organization, Henson Universal Music, Thames. Bookmark the permalink.